In addition to these club projects, five individual Rotarians led projects either through their employer, church, or as individuals. Operation Warm was introduced to our district at the 2009 Land of Lincoln PETS program for presidents-elect throughout the state of Illinois. Rich Lalley, 2009-10 president of the Rotary Club of Winnetka-Northfield, was impressed with the concept and took it back to his club. Widespread enthusiasm for the idea led the club to adopt the program last fall. With the intention of expanding the Operation Warm - Rotary partnership throughout the country, Rich joined the small staff of Operation Warm in late 2009 to lead its partnership efforts with service organizations, particularly Rotary clubs. Founded by Richard Sanford, charter member of the Rotary Club of Longwood in Kennett Square, PA, Operation Warm began as a club community service project in the late 1990s and now is one of the largest non-profit charitable organizations distributing new winter coats in the U.S. 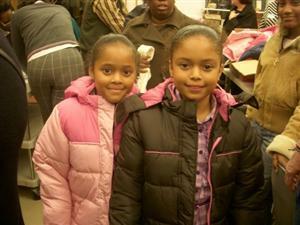 In 2010 Operation Warm distributed more than 150,000 new winter coats, bringing the total number of children served to more than 750,000 since 1998. This fall, 90 Rotary Clubs in 49 Districts have executed Operation Warm community service projects. Coats are still available this year. Contact Rich Lalley (rlalley@operationwarm.org) for more information.